Quartz is the Master Healer and the “stone of power”! Probably the most versatile multipurpose healing stone. Easy to cleanse, store information/ energy in, program or amplify energy and is used as a healing instrument. The natural tendency for quartz is for harmony. Quartz can both draw and send energy therefore it is effective for sending/receiving guidance. Quartz is used for transformation in healing and in all levels of change (mentally/emotionally, physically and spiritually) . Quartz stimulates the natural crystal in body tissues and fluids to resonate at the highest healing frequency. Quartz works with all chakras and master glands for balancing, cleansing and healing. It is the perfect stone for complete aura balancing. Quartz can be used to facilitate both speaking and receiving information from the spiritual world, masters, teachers and healers. Stimulates positive thought and healing. Quartz is considered Yin or Androgynous. Quartz is often used in healing remedies such as crystal elixirs or solarized water, in clusters during meditation, in reiki grids or laying of stones in a web around you. They are used to clean the aura and balance chakra energies. Quartz can be used anywhere that balance or cleansing is needed. Use quartz in the center area for grounding, balance, good health, spirituality and protection. Use in the west area for projects and creativity. Quartz (SiO2) is considered solidified light and oxygen. 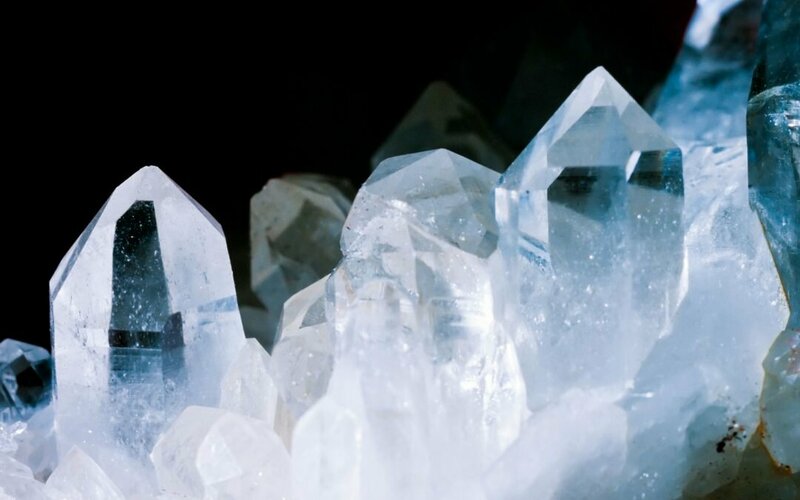 Quartz encompasses a large family of stones and crystals, all of which are made up primarily of silicon dioxide, one of the most common and most important substances in the world. Crystals of pure quartz, generally six-sided, can be found in all shades and colors. Quartz crystals grow singularly or in groups and take on different shapes according to the temperature at the time of their formation. Quartz crystals can also contain other minerals “frozen” within, as in Rutilated Quartz. Quartz can form a huge variety of aggregates, clusters, gravel, sand and single stones. Quartz can be smoky, milky white to clear as water. Quartz was used as tools and weapons early in history and are now used worldwide in watches, appliances and technology! Quartz can be formed of microscopic crystals and take on entirely different appearances and qualities. Other members of the Quartz family include Chalcedony, Agate, Amethyst, Aventurine, Carnelian, Citrine, Herkimer Diamonds, Jasper, Onyx, Sardonyx and Tiger's Eye. These are treated separately because their healing qualities are very different from crystal or “rock” quartz.